Favorite quotations: In the night, unable to sleep . . . In the night, unable to sleep . . . In the night, unable to sleep on the overcrowded train, it became clear that he was really going for the sake of his childhood, hoping to find something in those old streets: a doorway, a tower, a fountain, anything to induce some joy or sorrow by which he might recognize himself again. 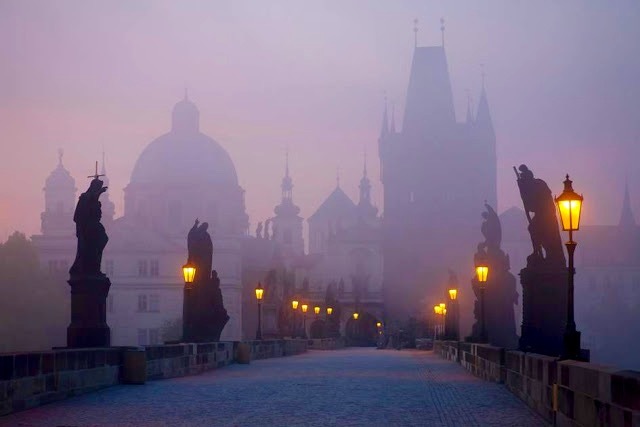 The bridge in the photograph is in Prague, where Rilke spent the first 21 years of life. He then went to Munich to study art history and there met Lou Andreas-Salome, who became his lover and then, for the rest of his life, his most trusted and important confidante. Her support and encouragement, through Rilke's long periods of doubt and depression, enabled him to complete the Duino Elegies. A new film tells the story of their relationship.